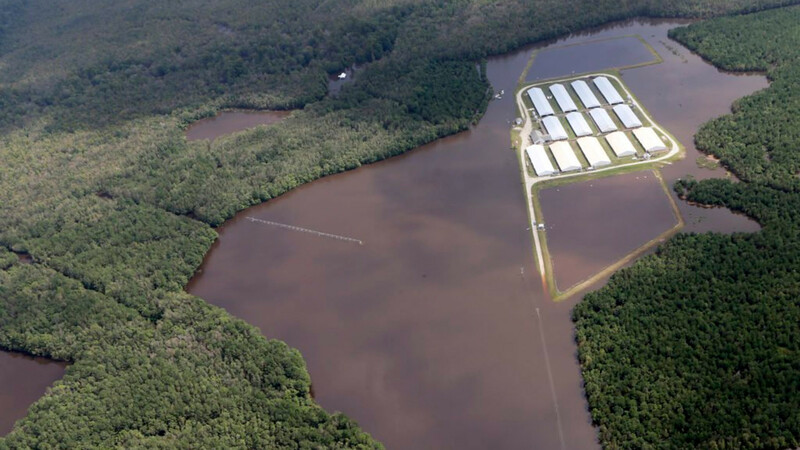 A North Carolina concentrated animal feeding operation (CAFO) floods during Hurricane Florence. Photo by Rick Dove, Waterkeeper Alliance. North Carolina’s CAFO Conundrum: How Do You Solve a Problem Like Manure Lagoons? Experts warn that we’ll keep having dangerous floods of feces unless state and the federal governments change the way big producers do business — and unless consumers start eating less meat. When Hurricane Florence descended on North Carolina last month, it left a devastating flood of farm-animal feces in its wake. The waste leaked from manure “lagoons” located on massive livestock farms called “confined animal feeding operations,” often known as CAFOs. Dozens of these manure lagoons — pits of pig waste mixed with water and slowly broken down by anaerobic bacteria — were breached or compromised during the storm, sending millions of gallons of effluent into nearby tributaries and rivers. It wasn’t the first time, and it’s not a small problem. North Carolina’s CAFOs hold nearly 10 million pigs, who defecate an estimated 10 billion gallons of manure every year. For years experts have warned that the waste lagoons collecting and treating all of this manure, many of which are located in flood-prone areas, are prone to leakage — just as we saw during Florence and 2016’s Hurricane Matthew. Even living near these sites under “normal” weather conditions has been linked to a long list of dangerous health effects, including a lowered life expectancy, according to a study published just days before Hurricane Florence. Addressing this situation — especially in the face of increasingly powerful storms driven by climate change — won’t be easy. Some other states are starting to take action on this. Missouri recently passed a health ordinance to regulate emissions from CAFOs, and some Iowa residents are suing to better enforce or tighten rules that govern harmful air pollution from nearby hog CAFOs. That might require action above the state level. “The federal government must help by disincentivizing this model of livestock production,” says Perry Stillerman. “The five-year federal farm bill should offer more technical and financial support for farmers to raise animals in safe, sustainable ways, and it shouldn’t subsidize CAFO waste storage and disposal.” A recent blog post by Perry Stillerman points out that CAFO operators received $113 million in the 2017 fiscal year for “funding improvements to waste storage facilities and subsidizing manure transfer costs” — an amount that could actually go up if the current version of the farm bill passes. The bill would also eliminate a program that provides incentives for sustainable livestock practices. The federal government, meanwhile, is partnering with North Carolina in another way. Since the year 2000 the state has offered payments to pork producers located in floodplains to shift to other types of agriculture, or to purchase conservation easements. The most recent round of buyouts, conducted in partnership with the USDA, cost taxpayers $18.7 million. So far 42 producers, including 34 that probably would have flooded this past month, have participated in the program, and applications are currently open for the next buyouts. North Carolina appears to have escaped a replay of this problem following last week’s Tropical Storm Michael, although that storm did cause severe flooding throughout the state. What the next storms will bring, and which CAFO manure lagoons might be affected, remains to be seen.